At Baydon St Nicholas British values are promoted throughout the day, not least during our daily worship, and RE and PSHCE lessons. The values are integral to our ethos statement which complements British values and always has done. The term ‘British values’ might be slightly misleading in that these values are integral to so many countries throughout the world – they differ in no way from the values of most western European countries. At Baydon St Nicholas we value and celebrate being part of Britain. In general terms, this means that we celebrate traditions, such as customs in the course of the year; for example, Harvest festival during the Autumn term, and what could be more British than a pantomime at Christmas! We also value and celebrate national events when applicable. Geographically: Topics which form part of our Four Year Rolling Programme ensure that children have a better understanding of what Britain is. Examples of what pupils will cover during the four year rolling programme include finding out about capital cities and counties, rivers and mountains in Britain and where Britain is in relation to the rest of Europe and other countries in the world (being part of a global community as well). 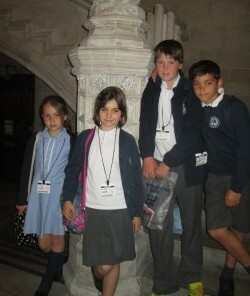 Historically: As pupils go through the school they will encounter topics relating to British history. When this is studied pupils will learn about an aspect life and how this has developed and changed over time. Democracy: Children, parents and staff have many opportunities for their voices to be heard at Baydon St Nicholas. Democracy is central to how we operate. An obvious example is our School Council. The election of the School Council members reflects our British electoral system and demonstrates democracy in action. Made up of two representatives from each year group, the School Council meets regularly to discuss issues raised by the different classes. Recently representatives from the School Council were able to visit the Houses of Parliament to find out more how British Democracy works in actions. Pupils agree their Class Rules and the rights associated with these; all children contribute to the drawing up of the rules at the beginning of the school year. Pupils are asked to respond and reflect about various aspects in the school. The importance of rules and laws, whether they be those that govern our school or our country, are referred to and reinforced often, such as in worships and when reflecting on behaviour choices. At the start of the school year, each class discusses and sets their own rules (a set of principles that are clearly understood by all and seen to be necessary to ensure that every class member is able to learn in a safe and ordered environment). Our pupils are encouraged to know, understand and exercise their rights and personal freedoms and are taught how to exercise these safely, (for example e-safety). At Baydon St Nicholas mutual respect is at the heart of our aims and ethos. Our pupils know and understand that respect is shown to everyone and to everything, whether it is a school resource or a religious belief. Pupils learn that their behaviour choices have an effect on their own rights and those of others. All members of the school community should treat each other with respect. Sadly, no school can guarantee that there will never be instances which are contrary to this value. At Baydon St Nicholas such instances are extremely rare. They are treated seriously in line with relevant policies and procedures.